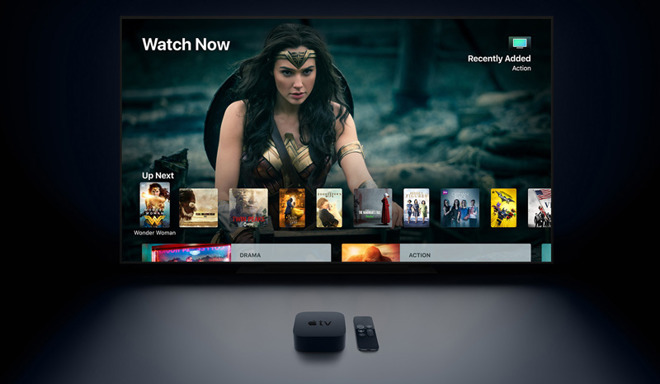 Video streaming on the Apple TV rocketed higher during the March quarter, with viewing hours up 709 percent year-over-year, according to newly published research data. By comparison, Roku hours were up 87 percent, said video AI platform Conviva, cited by TechCrunch. Roku, however, maintained the lead in total hours streamed — one billion — versus the Apple TV's 256 million. The video streaming industry as a whole is said to have grown hours watched by 114 percent to almost 5 billion. Conviva's data is relatively comprehensive, as its clients include the likes of CBS, Hulu, HBO, NBC, Turner, and Sky. It's not clear what was behind the surge of the Apple TV, but the Apple TV 4K launched in September. One of Apple's coups with the product was the ability to buy 4K versions of many movies at the same cost as 1080p. In some cases, previously purchased 1080p movies can be upgraded automatically. The set-top box is also one of the few that can output HDR (high dynamic range) video using either Dolby Vision or HDR10 — many devices only support one of the two, if any. Amazon also resumed Apple TV sales in December, simultaneously bringing its Prime Video app to tvOS. Apple may still have trouble catching up to Roku, which has had success with an agnostic approach to streaming services, as well as selling many different tiers of hardware. The company has also partnered with makers like TCL and Sharp on TVs that use Roku OS as their native interface.